Jack turned 7 months over the weekend. The time between month six and seven went really s l o w. I found myself asking if I had forgotten a month of pictures… and that was awesome. 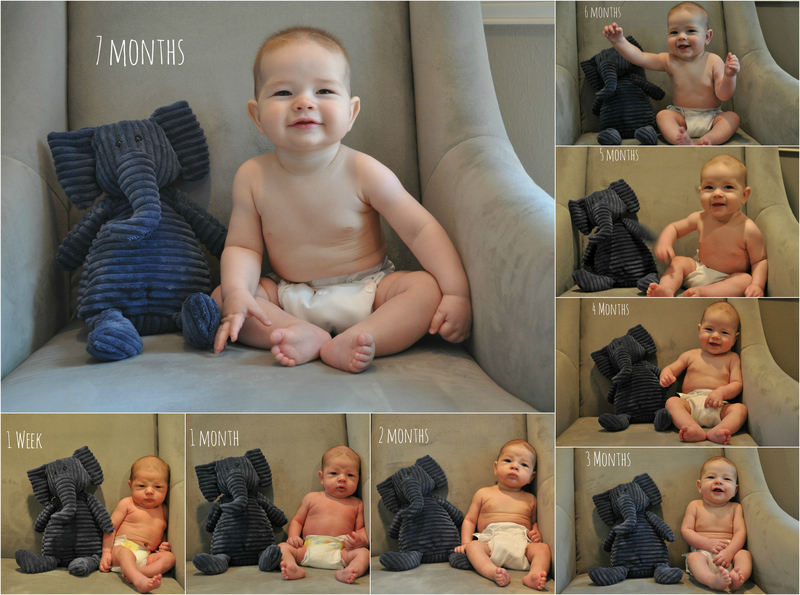 With Jack growing so quickly and changing almost daily, it was wonderful thinking time slowed, if only for a month. The time with Jack continues to amaze us both. Jack communicates daily with voice and actions, and he’s starting the motions of crawling, more like rolling and shifting with his arms. He looks much like a mermaid out of water. Sorry, merman! Because of his movements, he’s becoming more exploratory and independent. 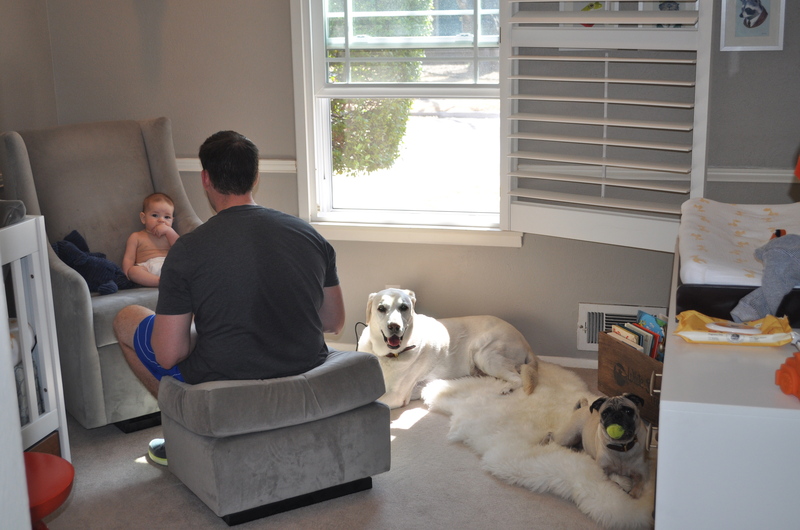 He can play on his mat or in his bouncer for 10 – 20 minutes, which allows us to make dinner or just zone out a bit. But, Jack does take the occasional nose dive which keeps us on our toes. He’ll put anything in his mouth from Otis’s tennis balls (our pug), to pieces of mail, to licking the fireplace. I think he’s just marking his territory in a completely different way. Or he might be watching the dogs too much!?! Food he’s liking lately: carrots, sweet potatoes with cinnamon, oatmeal and rice cereal. He isn’t a fan of zucchini or bananas, thus far. I think the bananas were a fluke because who doesn’t like bananas! Come on, Jack! Next up this week, avocado and pears! Jack’s also holding his own bottle but only when he feels like it. Here’s our big boy. 7 months, buddy. We love you. Below, I snapped this picture during Jack’s photo shoot. I had left the room to get something and realized this was a great “behinds the scenes” photo. It definitely takes a village (K9’s and humans, alike) to raise a baby and take monthly photos. What a simply beautiful picture of all my boys, beautiful 70 degree weather with the windows fully open in the background! Sometimes the simplest snapshots convey so much. I’m so blessed. What a sweet entry. Jack is growing up so fast and love “behind the scenes” with all your boys. Good work Sar! growing up. Love to all. G. Gram K.